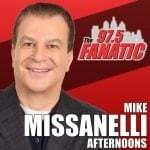 The man who revolutionized what great Philadelphia sports radio is all about and in the process turned PM drive-time talk radio on its head, Mike Missanelli, can be heard on the Fanatic weekdays from 2-6pm. 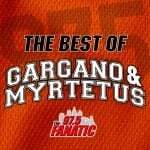 For over a decade on the Fanatic, Mike’s sports acumen, witty pop-cultural references and overall fun persona are just a few of the many factors that draw listeners to the show and helped him ascend to #1. The Mike Missanelli Show continues as the gang discusses the article written about Ben Simmons missing a game this season. They also discuss the Phillies-Mets game. The Mike Missanelli Show kicks off discussing the Chris Sheridan article written about Ben Simmons and the Sixers, and the Phillies-Mets game. In the final hour of the show Mike gives his thoughts on the Sixers after beating the Nets last night, but also dives into the Phillies, and Tiger Woods. Listen here! Mike continues to talk Sixers game 2 win over the Nets, did Philadelphia take Brooklyn's heart? Listen here! ESPN NBA Analyst Tim Legler joins the show to discuss last night's Sixers vs Nets game. Are the Sixers good enough to get through the East? Listen here! Mike continues to talk Sixers and Nets following a game 2 win for Philadelphia to tie the series at 1-1. Is Mike buying that the Sixers can bring that type of effort against the Bucks, Raptors, or Celtics? Listen here! Mike gives his take on the Sixers big win in game 2 against the Nets, including a franchise record breaking 3rd quarter. Also, did Simmons show something with an aggressive performance? Listen here! The final hour of the Mike Missanelli Show as we gear up for Game Two between the Sixers and Nets tonight. What do the Sixers need to do differently to win this game and tie the series at one? Sound Off comes up at 5:45. Sound Off for Monday, April 15, 2019!